On Sunday, I began my quest to regain control of my eating disorder (and return to a healthy body image and weight) by utilizing a meal delivery service. I selected Dine N Ditch, a locally-based company that caters to athletes and busy, working-adults who care about clean eating and overall wellness. Dine N Ditch delivers every Saturday morning (between 9am and 12pm) and Wednesday afternoon (free of charge), right to your house. One of my main issues with meal-planning is the repetition, but I have to admit right off the bat that this will not be an issue with Dine & Ditch. Every three days I’m provided with a totally different menu and never have to repeat the same meal more than three times in three days. Crustless Egg Quiches (mini-muffins) with turkey sausage and herbs. Grilled Mexican Chicken with carrots and fresh pico de gallo. Roasted chicken with homemade pesto and sauteed zucchini. Baked cod with cream sauce and sauteed green beans. Roasted chicken, mashed potatoes, and carrots with mushroom gravy. Every dish is gluten-free and they’re a pork free (and shellfish free) kitchen! As someone with a pork allergy, this is a big deal to me. I never have to worry about cross-contamination with Dine N Ditch, which is a huge worry off of my plate. And did I mention the food is incredible? Each meal is between 250-350 calories, has 25-35g protein, and is under 25g carbs (maximum). But here’s the real kicker: the meals are so filling and satisfying, I haven’t been able to eat all five in a day! In fact, I’ve managed to save one meal each day since Sunday, so I actually won’t need to worry about taking a “cheat day,” as I still have three meals leftover that I’ve frozen to use later. With eating four meals per day (roughly 1000 calories), I’ve given myself a 200 calorie allowance to be human – which I’m using daily with a piece of raw chocolate (under 50 calories) and a spoon or two of almond butter (between 90-180 calories) so I don’t go crazy and binge later. Already 2.6 lbs down in two days? Not too shabby. Yes, you read that right: protein-loaded potato chips. 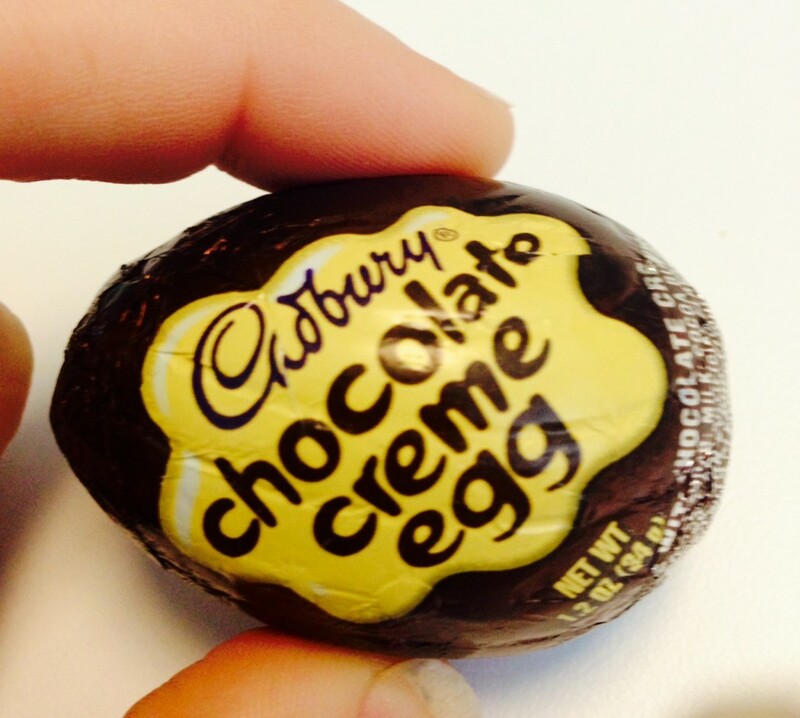 Not only do they exist, they’re also ridiculously delicious. As you probably know if you’ve followed this blog for a while, I’m a big fan of Quest Nutrition. They sell flavored protein powders (the caramel is to die for), protein bars, and, like a gift from Heaven, protein-infused potato chips and candy. If you’re like me, you’re probably VERY skeptical about the idea of a protein-packed salty snack, aren’t you? Lord knows I was. 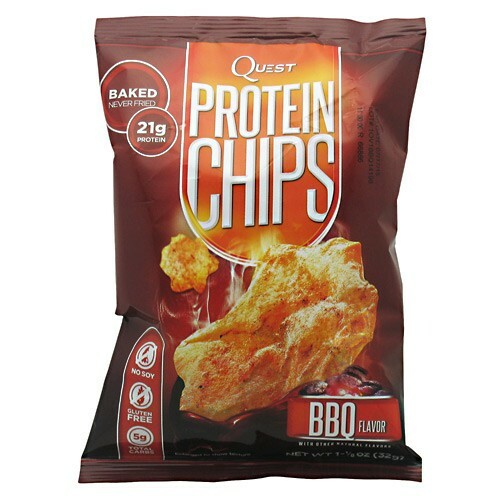 But, trusting in the delicious quality of the protein bars I’ve had in the past, I decided to order a couple packages of Quest Protein Chips on Amazon.com. Needless to say, Quest delivered on their promise. While the crunch isn’t the same as your favorite, high-fat kettle-cooked variety, these chips definitely deliver the potato-chip like texture you’re craving. I’d compare them to Pringles – thin and airy – but flavor-loaded. 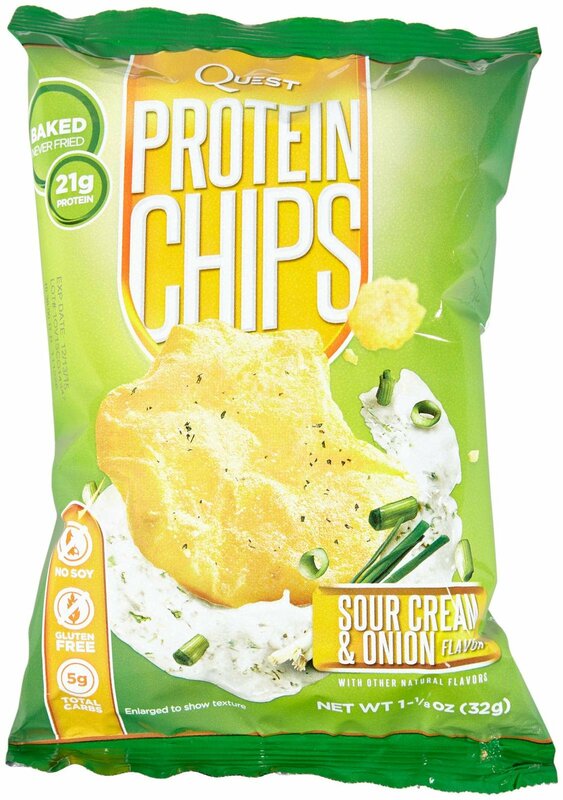 When I read the ingredients (and saw the Whey protein), I was worried these chips would have a chalky or awkward aftertaste, but I am pleased to report they were perfect. The seasoning blend was not too salty, but still packed a punch. My husband preferred the BBQ (he said it tasted like a spice-rub from his favorite restaurant), whereas I was absolutely hooked on the Sour Cream and Onion. They have a few other flavor options (Sea Salt, Salt & Vinegar, and Cheddar & Sour Cream) and I can’t wait to try them and see how they compare. As a note: the chips are very light, so I would *not* recommend them for dips unless the dips are very soft. I tried dunking the Sour Cream & Onion chips into some Greek yogurt dip and they cracked pretty easily, so I’d suggest a different alternative if you’re trying to recreate your long lost nachos. All in all, I’d strongly suggest stocking up on these (they’re super cheap on Amazon, especially if you use Subscribe and Save for bulk purchases), especially if you’re a sucker for salty indulgences. There is nothing to feel guilty about with these chips, and you’ll wonder how you survived so long without them! Lemon Coconut Creme Paleo (and Candida-diet friendly) Cake! As I mentioned before, a close friend of mine has been struggling under the confines of a very restrictive diet (Phase I of the Candida-diet) and the lack of variety has been very draining on her. Her birthday was last week and I knew she was very upset that not only could she not indulge on her birthday with a drink, a birthday cake was totally out of the picture. I decided I was NOT going to let her celebrate her 28th birthday without a sweet treat to make it special. Working with no grains, no sugars, and limited approved ingredients would make for a challenge, but I was ready to test my culinary prowess. Grain Free, Sugar Free, Dairy Free, and 100% Paleo-Approved. Well, if you recall, a few weeks ago I decided to experiment with a Candida-approved Italian bread recipe that turned out REALLY well. The cake would be prepared like any other cake: dry ingredients are first in the bowl, and then you’ll fold in the wet ingredients. Place dough (it’ll be thick, but pliable) in a 9″ round cake pan that you’ve greased ahead of time. I used organic coconut oil spray, but you can go with whatever oil you prefer. But what is a CAKE without icing? Now, I knew I’d never recreate a perfect, fluffy icing …and if I did, I realized it would be very temperature-weak, since it would have to be comprised of coconut oil which melts at pretty much any temperature over 72 degrees. So, I decided to forgo a traditional icing and aim for a lemony, zesty glaze to drizzle on top. After dabbling, I landed on the perfect recipe cited below. The icing is best prepared in a sauce pan on the stove, stirring NONSTOP until it thickens. Pour over cake while still warm. You’ll have a ton with this recipe, so think of this like a Lemon Tres Leches cake! And there you have it! My best friend got to enjoy a slice of REAL CAKE on her birthday, and I had a real win in the kitchen! For those of you worried about calories, the entire cake was roughly 2,100 total (with the icing included), and that worked out to about 10-12 slices, depending on how heavy-handed you are with your servings. If anyone wants a full nutritional breakdown (I have it! ), let me know! So, what are you waiting for? Time to start baking!